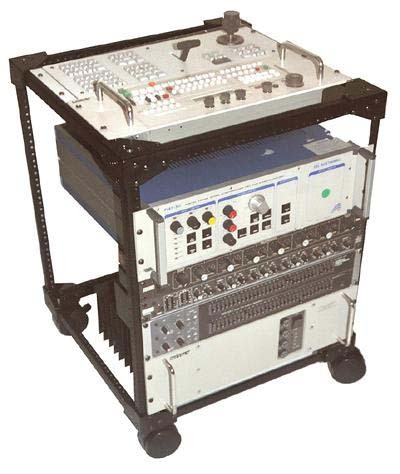 The 19 inch Rack Mounting Equipment Specification (EIA-310-C) covering "Racks, Panels and Associated Equipment", appears to have evolved from mounting systems employed with the Common Battery Telephone Systems of the late 19th Century, but it may have been as late as the 1940s that the standard was finally established. Two vertical supporting rails allow for the mounting of units. The horizantal space between these mounting rails is set at a minimum of 17.75 inches, so any unit being mounted must necessarily be less than this to allow it to fit into the rack. The maximum allowable width of any piece of mounted equipment (measured edge-to-edge across the so-called "mounting ears"), is the stated 19 inches. The vertically placed screw holes in the rack are spaced at 0.50 inch and 0.60 inch (on an alternating basis). This is totally in harmony with the standard 1.75 inch panel height, known as 1U, and ALL installed panels must be compliant multiples of that 1.75 inch 1U unit size. The panel mounting notches, or holes, which pass the (originally 10-32) mounting screws are standardised for the various panel heights. Vertical symmetry is maintained to allow "right-side-up" or "upside-down" installation. 5 8.75" 1.25", 2.75", 6.00", 7.50"
6 10.50" 1.75", 3.34", 6.75", 8.75"